This past weekend, I attended the Ontario Spring Classic, one of Canada’s premiere archery events usually held in Toronto. This year’s event attracted over 110 archers from Nova Scotia to British Colombia and several international archers including France, Netherlands and the United States. The Ontario Spring Classic is a two-day tournament and usually held every year over Father’s day weekend. The tournament starts with a ranking round on Saturday consisting of either double 720 round OR FITA1440 round. On Sunday the tournament finishes with a complete double elimination round. This year’s Spring Classic was a double 720 held at Bill Connor Secondary, and doubled as trials for the Youth Olympic Games and the Pan Am games trial run. This year’s competition marked my first outdoor tournament of the 2014 season. Saturday’s weather conditions for the double 720 were crazy. For June, it was very cold at 11°C outside and there were a lot of swirling winds that caused havoc for everyone. The winds were totally unpredictable, they were constantly changing direction and speed, forcing you to really watch closely on each and every shot. For me, I took the approach to have a good time, talk with friends, continue to embrace it as a new challenge, and a true learning experience. Although the weather finally cleared up for the last two ends, after fighting the winds, I was happy to get back to the hotel, take off my shoes, and sit in the hotel’s hot tub. Sunday was a complete reversal of weather conditions, sunny, calm and about 20°C. It was an absolutely beautiful day for shooting. I did manage to last through three rounds of elimination, finally losing to my World Indoor Championships teammate Gayle from Nova Scotia. For me, the best part was getting back to competition, shooting with some of Canada’s top World and Olympic archers, seeing all my friends and spending time with my mom and sister who accompanied me. 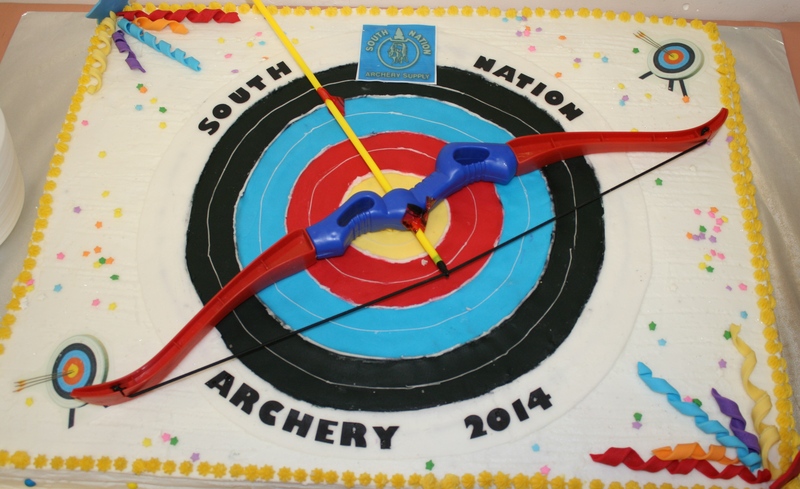 This past Wednesday, South nation archery supply held an awards ceremony; everyone did extremely well this past indoor season. Sydney, Josh and Cole all did very well this year winning several club and provincial medals. This past year, I was able to participate in a couple of tournament, however for me it was nice to see everyone again after being away for school. My highlight from this past indoor season was the MICA team event. The Multi-Indoor Championships of the Americas OR MICA for short. MICA is only one of very few indoor International Championships that is open to all archers that you do not have to travel for. Designated host archery clubs throughout North and South America host tournaments for both individuals and teams to submit scores from January 1 – April 30. Male or female archers can compete individually in cadet, junior, senior or master categories in either compound or recurve. Additionally clubs can also host junior or senior male or female teams in either compound or recurve, provided they are all from the same club. Since it is a FITA sanctioned event, individuals submit their score from a double indoor FITA (60 arrows) and the team event submit a FITA team score (24 arrows) where each archer shoots 2 arrows alternating for four ends. This is one of my favorite events and one of the few times you can practice the team event. This year, I shot with my sister Sydney, and our friend Lindsay and we captured the Silver this year behind the Brazilian team. On other exciting, my brother Joshua shot with his two friends, Josh and Kaleb Parker, participating in as a Junior team [all who are not Juniors] and shot new Canadian record for Junior Men Recurve Team division with a score of 211, however finished in fifth place overall. Congratulations to everyone at South nation for another successful year. A special thanks to our coach Kathleen Miller and Larry Smith for all their hard work this year. It’s been dubbed the “big show for the bow,” and that rings true as a rallying cry for the annual ATA Trade Show, but it’s also a million other things. For starters, it’s like a “second Christmas.” At least that’s what many eager retailers called the event through comments and posts on their shop’s social media accounts. Yet, the 2014 ATA Trade Show, held in Nashville, Tenn., at the newly constructed, downtown Music City Center, remains — first and foremost — a business opportunity for thousands of ATA members. Congratulations Hunter, Logan and Tyler and to the entire Canadian team. The 2013 edition of the Outdoor World Championships will be held from 29 September to 6 October in the municipality of Belek, Turkey’s Antalya Province. The Turkish Riviera is again the epicentre of a first class World Archery tournament. The outdoor season will culminate with this major event in another spectacular venue: the Beach of Belek will be home of the finals on 5-6 October. The qualification and elimination rounds will take place close to Belek, at the Papillon Sports Centre in Kadriye from 29 September to 4 October. To all my followers, I’m sorry I have not blogged in a while, however my family and I just got back from Woodstock, New Brunswick for the Canadian Nationals Archery Championships. This year’s trip to Woodstock was a 10 hour drive from Kingston, Ontario which was long however not as long as the drive to Saskatchewan a couple of years ago. This year was the first time that all of my siblings competed in the outdoor Nationals (my sister Sydney’s and younger brother Cole’s very first nationals). We all did really well and we had a lot of fun. For me, it was great seeing all of my friends from across Canada again and spending time together as a family since it was also our family vacation. This year’s national’s format was a little different, mainly because of the number of competitors, and setup of the venue. To accommodate everyone, the FITA 1440 and Field were split, with the Compound archers shooting the field on Wednesday, while the Recurve archers shot the FITA 1440 and on Thursday they switched. On Friday, everyone shot the 720 round with Recurve archers in the morning and the Compounders in the afternoon. The venue also sported two shooting fields (Range A and B ) so they had the senior males on one field, and the youth and women on the other field. It was cool, a little different from other tournaments where we all shoot together. The main event this year was the weather, there was sunshine, rain (light and down-pour), lightning and fog. There was sunshine on Wednesday, light rain on Thursday, and torrential down-pour with lightning on Friday and back to sunshine of Saturday. The FITA 1440 on Wednesday was my only day with nice weather. The field course on Thursday was very cool and I thought it was very similar to Saskatchewan’s field course. I loved shooting in the rain and the course was a lot of fun with all the mud and big puddles. Friday morning’s 720 was very challenging, the fog was so thick that you couldn’t tell whose arrows were who’s even through a scope. Luckily the 30-minute break because of the rain and lightning helped clear that up and we were back to rain, mud and puddles. The only thing that I would have like to have seen handled a little differently was the Canadian Open held on Saturday. Since, this year we had a large number of Americans participate at the Nationals it reduced the number of spots for Canadian archers in the Open. Although, I believe the Americans have every right to participate, I would have liked to have seen more Canadians in the Open. See, I believe it is very important for the development of archery in Canada to make sure archers are exposed to the elimination rounds. The elimination round is very different, are not that easy, and the primary format for international tournaments. All archers wanting to compete at the international level should become familiar with the elimination round as much as possible. Also, in Canada to increase your ranking, you need to compete in eliminations rounds, however there are very few elimination rounds hosted in Canada. One is the Quebec Provincial Championships in September, two others are held about the same time, the Canada Cup (West Coast) and Spring Classic (Toronto) and the third is the Canadian Open during the National Championships. I hope in the future, the National archery committee allows everyone to participate in the Open if they want to. The next Canadian National Outdoor Championships are being held in Lac La Biche, Alberta in August 2014. The schedule includes 3D from the 1st through 4th, the Field on 5th and 6th, and Target on the 7th through the 10th. Since I believe athletics are important in developing a healthy lifestyle and personal self esteem, the KCVI archery club is special to me. While I am fairly athletic, when I joined KCVI’s Athletic Association, I noticed a lack of sports open to all even for non-typical athletes; something where you can participate at your own level and feel confident and accepted. As a NCCP certified archery coach, range safety officer and national level archer, I knew I could start a program that would inspire anyone to come out, get active, and engage in sport. So in 2011, I proposed the idea of starting an after-school Archery Club to our Principal for the next year. In the fall of 2011, with the assistance of my younger sister Sydney, we started with four students meeting every second week for 1.5 hours. I coached the group of members, focusing on safety, technique and encouraging them to have fun and enjoy it. They enjoyed it so much they started to recruit others. By the end of the first semester, we had tripled our membership. This year, with the absence of sport due to the teacher work to rule strike, I was able to convince my mother to act as the supervising adult and our principal as the supervising teacher. There was so much buzz, kids with talking about archery club in the halls, our membership increased to over 50 students. We have decided to meet every Friday after-school for 2 hours to accommodate the influx of participation. Awarded to the archer who shows the most dedication to the club, sport, and it’s members. Not only did they always attend on-time, they were also supportive and respectful to the members, the club, the equipment, the sport, and stepped up to help when it was needed most. Awarded to the archer that not only improved in skills in the sport of archery but also in self growth. To improve means to be better than you were before even if it is hard or not what you would normally do, to challenge yourself to be a better person. Awarded to the archer that is the most enthusiastic, who also perseveres and continues to look on the bright side. This athlete should always look for something to be happy about and keep trying and help others when they are going through a hard time. Awarded to the athlete who showed the most sportsman like traits. This athlete does not get upset when they lose, or gloat when they win, or are not mean to other athletes. Instead they show true character by being humble in winning and gracious in losing. Last Friday also concluded the last year I will lead the club as I am graduating and off to Redeemer University in September. It has been a very gratifying experience starting and running the archery club over the last couple of years. 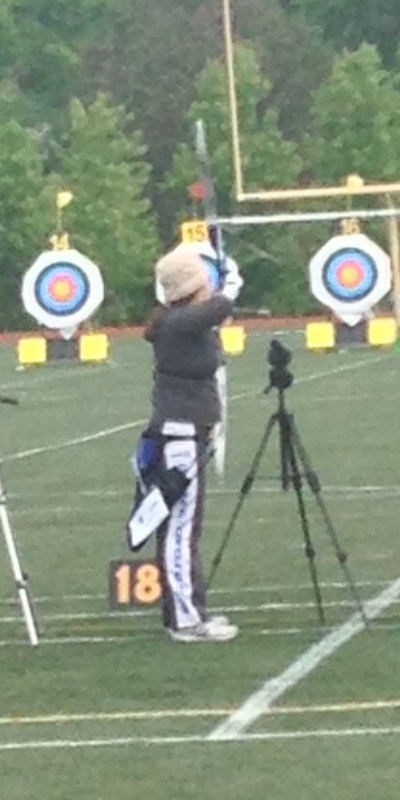 I have learned a lot about coaching, organizing and leading an archery club. My hope is my younger sister Sydney will continue to lead the club during for her grade 12 year and others will step-up so the club will continue for years to come. Thanks to everyone who helped organize, run, step-up, tear-down, watch-over and participate over the last two years. Happy Shooting! !